Cato was a gift, although I didn’t know that for a long time. 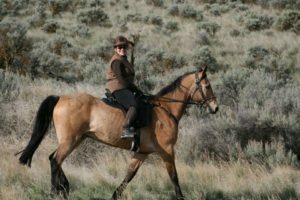 After two years of searching for the perfect endurance horse, I discovered Cato in the foothills of the Bitterroot Mountains. He came from a herd owned by one of America’s top ten endurance riders. A proven 100-mile horse, he had a short but impressive endurance record. He was bold, powerful, athletic and fast. When he stepped out of the trailer at Epona Meadows, I had visions of Top Ten finishes. Filled with excitement and anticipation, I saddled Cato up the very next day for our first ride. And that’s when it all began to fall apart. 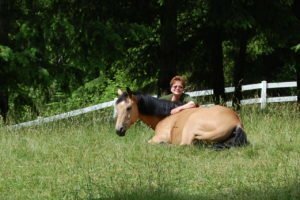 I quickly discovered that riding Cato was like getting been behind the wheel of a high performance racing car for the first time, with no lessons. By comparison, I was used to driving Volvos – safe, reliable, steady horses. Not high-strung, temperamental, nervous sport horses like Cato. He grabbed the bit in his teeth and tore off down the trail like a Japanese bullet train as I hung onto his mane for dear life. He spooked at invisible monsters that lurked behind every tree and barn door. Within weeks, I had been unceremoniously dumped many times. I had scrapes from wrist to elbows. One time he cannon-balled me off over his head. I skidded for about 15 feet on hard packed trail. That fall left me with a bruise the size of a football on my thigh. For three weeks, I couldn’t wear pants. Make time. Great teams don’t happen overnight. Smart leaders schedule at least one annual get together that’s about the team – NOT work. Pay Attention. If great teamwork doesn’t matter to you, it won’t matter to your team. Notice when you have it; do something about it when you don’t. Have Intention. Teamwork is all about relationships. Make the commitment to know your people – who they really are and what matters to them. Despite all this, I gritted my teeth and re-doubled my efforts. After all, I had miles to ride and rides to win. I had invested time, money, my endurance hopes and dreams in Cato. I wasn’t giving up that easily. As our daily skirmishes continued, I became increasingly frustrated and angry with Cato. He was too tall, too fast, too dumb. He wasn’t well-trained. Most of all, he was nothing like my other horses. Clearly, everything that was wrong between us was his fault. I decided to try a new trainer. Robin is a no-nonsense horse woman with a reputation for working miracles with difficult horses. And Cato was nothing if not difficult. I figured if anyone could fix him, she could. Robin remained firm. ‘If you want a relationship with Cato, you’re going to have to earn it. You’re going to have to build trust. Well, Cato and I were clearly at a crossroads. What if Robin was right? If I wanted to do any successful and safe endurance riding, perhaps I was going to have to change my approach. Maybe I was going to have to go slow, to go fast. And so, as spring turned into summer and endurance rides happened without us, Cato and I spent time in the arena, on the ground, working through exercises that helped us establish trust, communication and partnership. In fact, he taught me alot about what I now teach indviduals and teams when they come to Epona Meadows to work with my horses on their leadership skills. I discovered that Cato was my emotional mirror and began to see the honesty in what he reflected back to me. If I was tense, so was Cato. If I was anxious, Cato started looking for the monster my behavior told him was hiding in some corner of the arena. If I relaxed, he relaxed. If I was calm, so was he. Steadily and slowly my relationship with Cato began to improve. We started taking long walks through the neighborhood, calmly passing horse-eating garbage cans and mailboxes. Eventually we got back on the trail, and worked our way by gaggles of cyclists (think wolves and mountain lions), big logs (pythons in disguise), and over bridges that could be hiding horse trolls. I started counting the number of spook free miles Cato and I could go, rather than how far and how fast. Cato and I have spent many years together on the endurance trail. I remember the summer we finished our first top ten, placing 8th out of 40 starts. Nearly one-third of the horses and riders didn’t finish that ride because of the heat and terrain. When we sauntered across the finish line, I had dust in my teeth and a huge smile on my face. Do you ever focus on results at the expense of your relationships? Do you ever demand rather than motivate? Do you ever get angry and frustrated when someone doesn’t do what you expected? If so, maybe you need to go slow, to go fast.